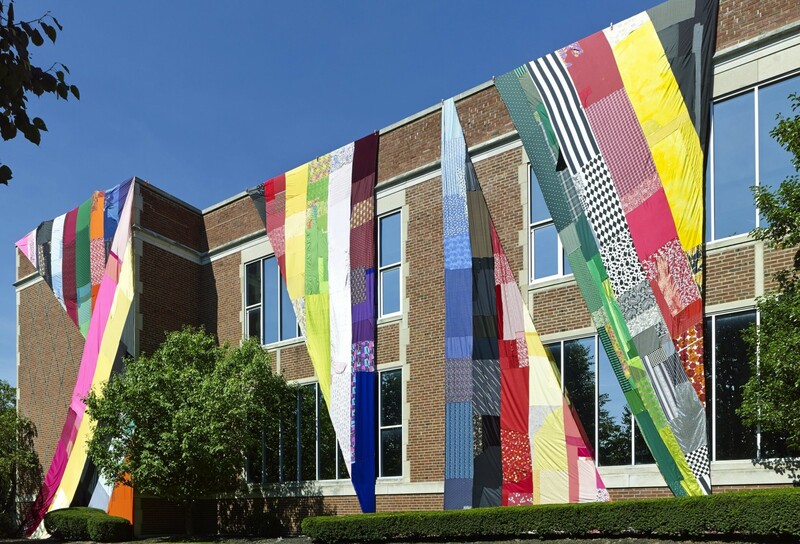 Amanda Browder’s fabric installation “Prismatic Illusions” hung on the exterior of the University at Buffalo Anderson Gallery in September before moving to the lightwell gallery in UB Art Gallery in October 2015. Three buildings in rapidly changing city neighborhoods will receive temporary makeovers in August as part of a public art project that will repurpose hundreds of yards of donated fabric into enormous tapestries to shroud the structures’ facades. The community-fueled project, sponsored by the Albright-Knox Art Gallery and executed by Brooklyn-based artist Amanda Browder, will temporarily sheathe the former Richmond Methodist Episcopal Church at Richmond Avenue and West Ferry Street, the historic Eckhardt Building at 950 Broadway, and the Albright-Knox’s Clifton Hall in patchwork outfits seemingly lifted from your neighborhood AMVETS store. The locations were announced Tuesday morning. Western New Yorkers are being invited to donate fabric to the project and to help stitch it together on one of nearly 30 “sewing days” from April through August in locations throughout Erie County. The three-pronged installation follows Browder’s visit last year to the University at Buffalo’s Anderson Gallery, during which a section of the Anderson Gallery was covered in fabrics sewn together by members of the community. That work was later reinstalled inside the UB Art Gallery’s Lightwell Gallery in Amherst. The locations chosen for the project, according to an Albright-Knox release, “constitute a civic conversation that links the East and West sides of Buffalo, with the Albright-Knox as a central point.” They were selected to help draw attention to neighborhoods and buildings currently undergoing or readying for major new developments, including the planned expansion of the Albright-Knox Art Gallery and the launch of the planned Rosanna Elizabeth Visual and Performing Arts Center on Richmond Avenue. The fabric will remain on the buildings for two to three weeks, and possibly longer. In an interview last fall in the Anderson Gallery, Browder said she began sewing as a third-grader and has maintained an interest in fabric ever since. Secondhand fabrics have long been part of her work, which has gained her nationwide attention for its jarring, if short-lived, effect on the built environment. Like another recent fabric-based project, Kaarina Kaikkonen’s shirt-based installation in Buffalo Niagara International Airport, Browder’s planned piece, called “Spectral Locus,” explores the tension between public and private. The personal nature of Browder’s work comes not only from the colors and patterns of the fabric itself, but from the collaborative way it’s pieced together. The “sewing days” planned for public locations in Erie County through the spring and summer will involve people with all levels of experience sewing together donated fabric with the aim of creating a unified tapestry – dozens of human stories woven into one. The sewing days, some of which are planned for the Albright-Knox and the Buffalo History Museum, are also about turning public spaces that can sometimes be daunting or off-putting into ad hoc community centers where the sense of collaboration overrides the alienating effects of white walls and glowering security guards. UB Art Galleries curator Rachel Adams, who brought Browder to town last year, praised her work as an ideal project in a region that is seeing an influx of new public art pieces. And that memory of a temporary interruption in city-dwellers’ normal daily experiences, Browder said, is an important part of her approach. Donated fabric for the project can be dropped off at the Albright-Knox Art Gallery (1285 Elmwood Ave.), the Central Library (1 Lafayette Square), Buffalo Arts Studio (2495 Main St., fifth floor), the Hamburg Public Library (102 Buffalo St., Hamburg), Olmsted Center for Sight (1170 Main St.) and Starlight Studio and Gallery (340 Delaware Ave.). A full list of “sewing days” and locations can be found at albrightknox.org.